Posted on February 1, 2014 Posted in Cakes, Sweden, Traditional	. So someone said to me the other day why don’t you bake an apple pie. My response was ‘to boring’ I like to try ‘out there’ unexpected flavours and then be surprised when the flavours are magic and I uncover a hidden gem recipe…However, I also love to ‘uncover’ traditional global dessert recipes – I think this is because some cultures have flavours I have never even heard of which peaks my ‘trial & testing’ obsession. But, it did get me thinking, I do baking a lot with fruit and the recipes have in the most part been amazing and there are millions of different apple pie/tart/slice/cake/torts/jelly/trifle recipes. Preheat the oven to 180c and line a 25cm cake tin with baking paper. Peel the apples. Dice 3 into 1cm cubes. For the 4th apple slice thinly into moon shapes to decorate the cake. Sift the flour, baking powder, cinnamon and sugar in a bowl. 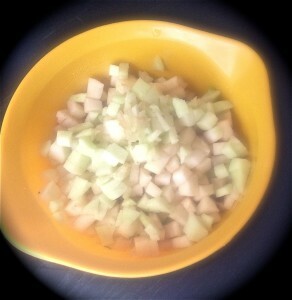 Add the diced apple to the bowl and mix with dry ingredients well. Add the softened butter and eggs until all ingredients are well combined. 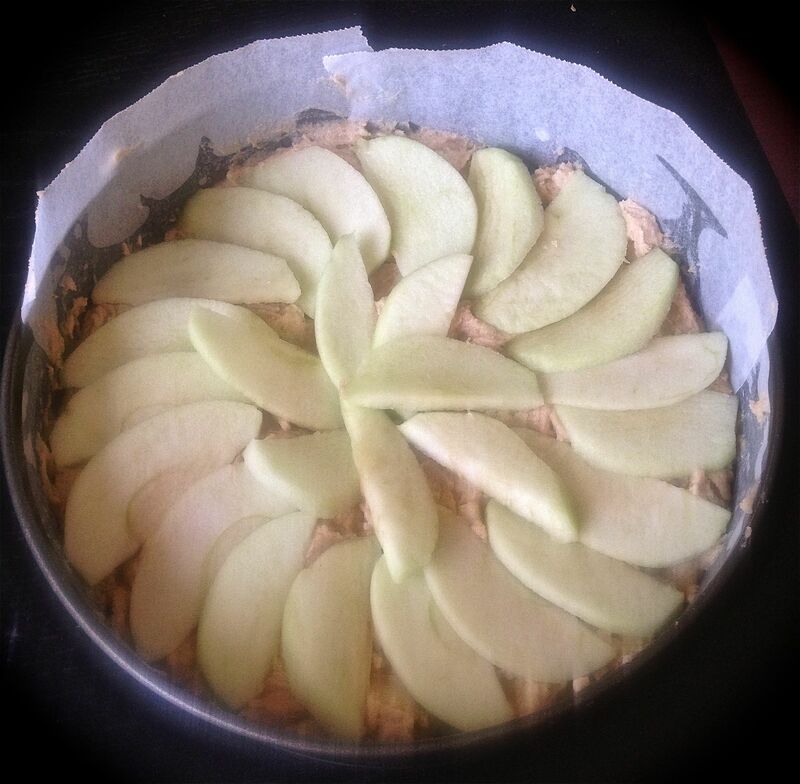 Place the sliced apple in a fan shape on top of the batter. Bake for 60 minutes or until a skew inserted in the cake comes out clean. 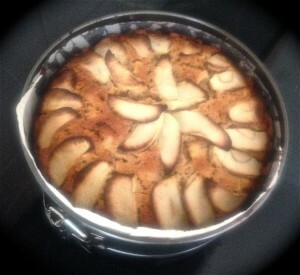 Cool the cake in the tin for 10 minutes, then transfer onto a cooling rack. Make the glaze by combining the ingredients together in a small pan on low and stir until the sugar dissolves. Turn up heat to medium until the glaze thickens to half the measure. Using a pastry-brush brush the apples on top of the cake with the glaze. The reason you need to make sure you mix the dry ingredients with the diced apple is because covering the apple in flour will ensure the apple does not sink to the bottom. 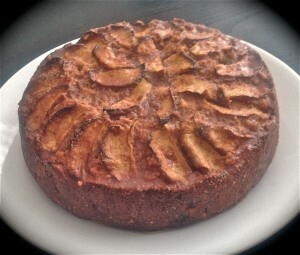 As the apple is diced so finely after cooking the pieces themselves break down, making the cake smooth in texture and apple intenseness in every bite. 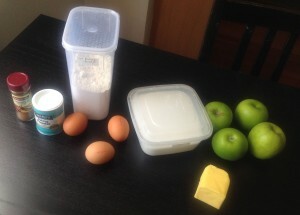 If you would like to actually have apple pieces in the cake you will need to dice into 2cm sizes. 150g sugar may not seem like that much for a full cake, however as apple has natural sugar they bring this into the cake (that is if you have nice tasty apples and not apple on the sour ‘to ripe’ side). Don’t try to make the glaze in the microwave. I am all for time saving and making things easier but this will only make a water like glaze texture not a syrupy one. This cake does not need icing (that would not work at all), if you want something to eat this with ice-cream or a dollop of cream would go down a treat. This would also be perfect for people that don’t have as much as a sweet tooth as it will dull down the sweetness. Tags: apple, cinnamon, recipe, swedish, Swedish Apple Cake, traditional	.